On November 25, Queenslanders will go to the polls to vote for the people who will represent then in Parliament. We’re out and about talking to the candidates in electorates across Brisbane, asking their support for projects and policies that will make cycling a safe, easy, and attractive transport choice. LNP candidate for South Brisbane, Simon Quinn failed to turn up for an appointment. Twice. Belinda, East BUG: I arranged with Simon Quinn’s campaign director 2 weeks ago to meet the LNP candidate for South Brisbane on a Friday afternoon when I could leave work early. I was annoyed when he failed to show or get in touch, but was willing to put that down to a communication failure when his campaign director finally contacted me over a week later. We arranged another appointment for this morning, but once again Simon Quinn failed to turn up, and did not get in contact to notify me or apologise. Please excuse me if I show little interest in reporting his position on active transport. This evening, I went along to the Politics in the Pub forum at West End to hear from the other South Brisbane candidates – along with Caroline who deserves a medal for having now sat through four politics in the pub events in 10 days. It was good to see more than 20 bikes locked up outside the forum venue. Before the session, we had a chance for a quick chat with Dr Cameron Murray (independent) who wants to ensure that the profits which property developers make when land is up-zoned are taxed so that a significant portion of that value is returned to the community. This is a way to ensure that government (both state and local) is able to afford to supply the essential services to cater for the increasing population. It provides a simple answer for how to fund infrastructure such as bikeways and green bridges! I asked the candidates if a state government they were part of would be prepared to invest in building (as opposed to just investigating) new green bridges across the Brisbane River. Independent candidate Frank Jordan replied that he supported a pedestrian and cycle bridge between West End and Toowong. Karagh-Mae Kelly (Animal Justice Party) replied that her party does not have a policy on green bridges but that she is in favour of better active transport infrastructure so, yes. Independent Dr Cameron Murray responded that he would not support new general traffic bridges that brought vehicles into areas which had not previously had through traffic, but he was open to green bridges. 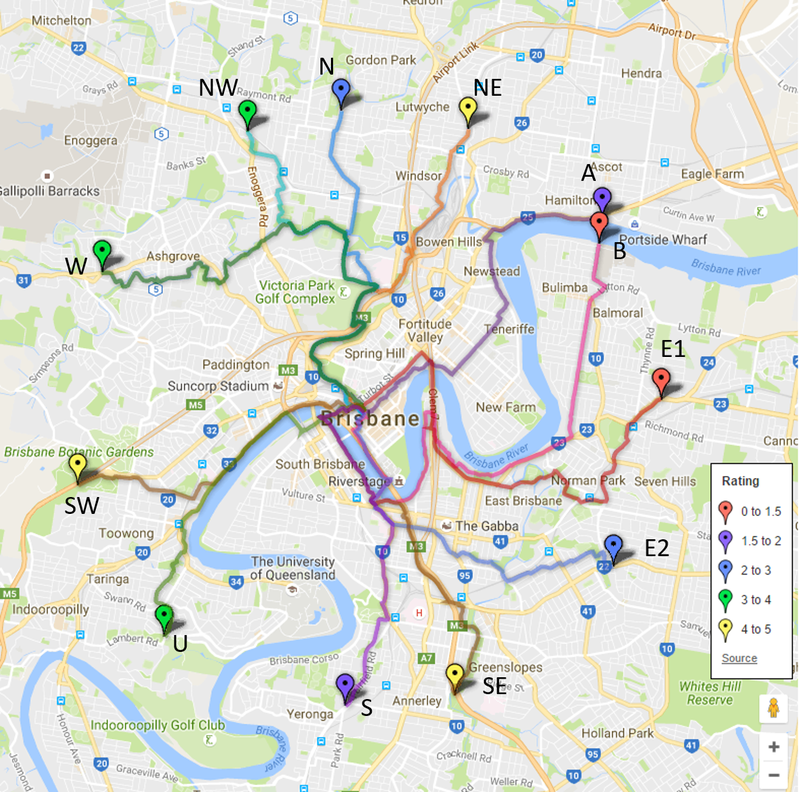 Amy MacMahon, (The Greens) highlighted the Greens policy which includes a commitment to 3 new green bridges: from Bulimba to Teneriffe, Kangaroo Point to the CBD, and West End to Toowong. Karel Boele from People Decide is committed to voting according to community decisions reached through a process of participatory democracy and expressed confidence in the ability of engaged citizens to make good decisions on issues like active transport. Labor’s Jackie Trad MP highlighted the performance of past Labor state governments and councils in delivering green bridges, and said yes, she would support a new green bridge for Brisbane. The elusive Simon Quinn (LNP) – who finally arrived about an hour late – equivocated, saying he would need to see further studies, and then added that he felt the state could not afford a green bridge due to high levels of debt. Belinda, EaST BUG: We had a good crowd at the Politics in the Pub event for the McConnel candidates at the Powerhouse tonight. Caroline asked what the candidates would do to improve active transport in the CBD and The Valley, and if they supported a green bridge across the river. All six candidates stated their support for bikeways! We’d spoken to the other candidates previously, but I took the opportunity afterwards to chat with Kamala Emanuel who is standing on behalf of the Socialist Alliance (who are not yet registered as a political party in Queensland, although they are at federal level). Kamala is an advocate for protected bikeways, knowing that painted lanes just don’t cut it to make people (particularly women) feel safe riding on the road. She’s a little disappointed that CityCycle doesn’t cover her area, and would support the expansion of public bike hire since even the cost of owning a bike is a barrier for some people. Kamala would definitely support more green bridges. Socialist Alliance policies include: no more motorways/tollways; ensuring railway stations, bus stops, and ferry terminals include bicycle storage and facilities; requiring all new urban development to provide adequate public transport, cycleways and walking paths; carriage of bicycles on urban public transport; and ending all tax concessions for company and company-purchased cars. Amy Rayward of Civil Liberties, Consumer Rights and No Tolls noted that from where she lives in Mt Crosby, the famous camel humps are a dangerous route to take but provide the only route towards Kenmore. She supports investigating a separate bike way along Mt Crosby Rd. When I caught up with her before the forum, Amy noted that many roads in the area are too narrow for bike lanes but she supports looking at parallel routes and secondary roads as options to help keep bike riders separated from traffic but able to get where they need to go. Labor candidate Evan Jones acknowledged the need to prioritise active transport and that utilizing existing space alongside road corridors like Mt Crosby Road could be a quick win while longer term transport plans take place. In my earlier conversation with him me mentioned my video of the close pass by a truck on Mt Crosby Road that gave me an incredible fright recently. While Evan supports long term planning, he agrees that it should be a no-brainer to use the state-owned corridor alongside the water pipes for a bike path, helping riders from Bellbowrie avoid busy Mt Crosby Rd to Boyle Rd. Dr Christian Rowan MP from the LNP acknowledged my strong and passionate advocacy for Brisbane West BUG and outlined how the LNP’s $5m western suburbs transport plan would prioritise cycling connections. He challenged Labor to commit to that plan if they win government. Lawson McCane, Greens for Moggill spoke about the importance of active and public transport integrating and supported the prospect of a cycle bridge alongside the Greens’ proposed rail bridge into Bellbowrie which would enable cyclists to access the new station or continue across the river. Afterwards thanked me for the mapped suggestions I provided to address the most dangerous stretches of Moggill Rd. Lawson said they were the type of solutions he could work with Council to deliver. He also noted the proposals would be supported by some residents he had met who just wanted bikes off the road. Stella, CBD BUG: I’m new to this campaigning caper, so it was good to talk to another newbie: Edward Gilmour is standing as a candidate for the first time, running as an independent in my electorate of McConnel. Edward describes himself as a conservative with a ‘blinking green light in the background’. He supports separated bike lanes, pedestrian/cycle bridges and more rail infrastructure. Edward was very friendly and keen to talk to Mitch and myself about cycling topics. Later in the day, I met the Greens candidate for my electorate, Kirsten Lovejoy. We had a great chat, as Kirsten also rides her bike everywhere, and has been a supporter of Space4cyclingBNE since the group was established. She had already met with Donald this morning too. We chatted about the Green’s cycling policy, which includes support for a grid of protected bikelanes in the CBD – which I would *love*, as I commute to work in the city and find the CBD streets really hostile. Mitch, Airport BUG: At the Milton markets this morning, the only candidate I could spot was Reece Walters, the Greens candidate for Cooper. Reece said he supported better bike infrastructure on main roads and at railway stations, and believes the state government should be more involved in bicycle infrastructure on local roads, rather than just fobbing it off as a local government issue. We also discussed the Casino development at Queens Wharf which will negatively impact the Bicentennial Bikeway – a important commuter route, especially for residents of Cooper cycling to QUT or to the Goodwill Bridge. Belinda, EaST BUG: On a rather wet bike ride this morning, I caught up with Gordon King from The Greens who is standing for the new electorate of Toohey in Brisbane’s southern suburbs. We discussed the lack of a good east-west connection through the electorate, and what the state government could do to make the Granard Rd, Riawena Rd, Kessels Rd route into a safe cycling corridor. Gordon is also keen for a good north-south connection linking Sunnybank and beyond to the SE Bikeway. He has been exploring, and thinks Pinelands Rd and Mains Rd is the obvious route topographically as it follows the top of a ridge and is essentially flat – although he does recognise that provisioning for cycling along Mains Rd would be challenging. That route would provide cycling access to many key locations close to the top of the ridge including schools, train stations, shopping centres, and Griffith University, as well as providing a commuting link to the city. Chris, West BUG: This morning I met Ian Eugarde who is standing for the seat of Mount Ommaney representing Pauline Hanson’s One Nation. I had previously mentioned the benefit of a green bridge between River Hills and Bellbowrie and since, Ian has been making contact with various bodies that might be interested, including the Property Council of Australia. Ian sees the potential for a bikeway between Rocks Riverside Park and Oxley Train Station, utilising the former Oxley Secondary College land to provide an active transport connection. It’s great to meet motivated people who get out and try to make ideas become a reality. This afternoon I braved the rain to ride in to Ashgrove and see Kate Jones MP, member for Ashgrove and Labor candidate for Cooper (as the electorate has been renamed). Kate enjoys riding for recreation on Ashgrove’s creekside bike paths, but admits she’s too scared to ride for transport on roads. She was interested in my ebike and could see how that would help in hilly Cooper. As Minister for Tourism, Kate was baffled why Queen’s Wharf would build a bridge without bike access, and to design conflict on the bicentennial bikeway. She committed to raising it when she next meets the consortium. She also saw the value in better secure bike parking at public transport hubs integrated with GoCard or other smart ticketing and would be happy to advocate for it. Belinda, EaST BUG: I was keen to catch up with some of the Lytton candidates this morning, so headed out to Jan Power’s Market at Manly. I’d barely made it in to the electorate before my first soaking, but in typical Brisbane fashion I’d almost dried out again by the time I arrived. The only candidate I could find on site before 9am was Labor’s Joan Pease MP. We had a chat about the importance of linking public and active transport – in particular providing bike parking at railway stations where bikes can be protected from casual vandalism and the weather. Labor has recently committed $5million to provide an additional 70 car parking spaces at Lindum Station, and I aim to ensure this will include bike cages conveniently on both sides of the railway line to encourage more people to ride, lock, and ride as well as to drive, park, and ride. Joan (who I know rides herself, and understands the concerns many people have about riding on the road) commented that not everyone can ride a bike. But of course not everyone can drive either. Indeed, there are many people without a licence or a vehicle who will benefit from better active transport connections to stations, and better bike parking. Since I couldn’t find any other political contenders at the markets or other nearby shopping centres, so I decided to pedal past the stations at Wynnum, Wynnum North, and Lindum to check out the bike parking situation there. Let’s just say there’s huge room for improvement. Next I went in search of the member for Chatsworth, LNP’s Steve Minnikin. After a bum steer from one of his team who was out waving at cars on Meadowlands Rd, I toured almost half the electorate before giving up in frustration, but then spotted the LNP campaign team on Old Cleveland Rd at Carina on my way home. I was keen to understand the LNP’s plans for improving bus flow along Old Cleveland Rd, as that is also a critical bike route. It was good to hear Steve say active transport must be included, and that we should incorporate solutions proven effective overseas to avoid conflict between people on bikes and buses. Steve was quite adamant he will not be able to achieve upgrades along Old Cleveland Rd unless the LNP form government, and that things work best if the same political party has power at both state and Council level. I pointed out that I don’t give Labor councilors a free pass because they’re in opposition: I expect all representatives to advocate hard and put the community’s needs ahead of political point scoring. My next conversation was with another candidate for Chatsworth; this time Labor’s Paul Keene. Once again, Old Cleveland Road topped the list of issues, and we discussed Labor’s recent announcement to prioritise buses along that route. Paul is very knowledgeable about the road from a cyclist’s perspective, and also incredibly conscious of safety issues from his experience in the Queensland Police – including preparing material for the Coroner in a number of cases involving cyclists over recent years. He explained that the transitway proposal through Chatsworth primarily involves upgrades at key intersections and prioritising buses ahead of on-road parking. Paul is very much a proponent of a safe-systems approach, and is committed to working with local riders and advocacy groups to ensure cyclist’s safety is not treated as a secondary or tertiary issue along Old Cleveland Rd. We also compared notes on other problem intersections in Chatsworth, including Belmont Rd / Meadowlands Rd, Belmont / Wynnum / Manly Roads, and the Old Cleveland Road / Gateway Motorway interchange. Paul is keen to capitalise on the sporting infrastructure in the electorate, pointing out the irony of having the state’s premier track cycling venue at the Chandler Velodrome being difficult to access by bike. Finally, I also managed to catch up with my local MP for Bulimba, Labor’s Di Farmer MP. Di committed to ensuring that active transport advocates were brought in at the very beginning of the planning process for the Cannon Hill station upgrade. I also raised the possibility of bikeways utilising the rail corridors, and there Paul was able to give me the only solid explanation I have received to far for why we are so conservative with our safety clearances in Queensland: it is to do with arcing distances from the electricity supply in Brisbane’s extreme weather. That of course doesn’t make bikeways along rail lines impossible, but potentially more expensive if some sort of Faraday cage is required. Andrew, North BUG: Have you ever talked to someone and found very quickly that they totally understand and want what you want? Well that’s what happened today when I sat down and talked cycling with Miree Le Roy, the Greens candidate for Sandgate. Miree is fellow bike rider and understands the joys and frustrations of cycling in Brisbane. Miree was well versed on the Greens policy about ways to make cycling safer, such as the CBD grid and the benefits of protected bikeways and better ways to get bicycles on trains. It was great to meet a candidate who actually rides a bike. Andrew, North BUG: Today I caught up with Labor candidate and sitting member for Sandgate, Stirling Hinchcliffe MP, to talk about ways to make cycling in the area easier. Stirling was particularly keen to explore what the next generation of smart ticketing will bring, and how this can be integrated into such things as bike hiring and accessing bike storage areas at train stations. We also talked about making Sandgate Rd safer, and possibilities for the next generation of trains to include bike hangers in one of the carriages; an idea Stirling could see the merit in. Andrew, North BUG: Along with other representatives from North BUG and Airport BUG, I headed to Sandgate this evening for the Pollies in the Pub event at Mr Henderson’s Bar to hear from the candidates for the Sandgate electorate: Matthew Stephen (Pauline Hanson’s One Nation), Labor’s candidate and sitting member Stirling Hinchliffe MP, Greens candidate Miree Le Roy, and Jessie Van Der Hoek from the LNP. It was a full house as usual but we were a little disappointed our question about active transport – which we posted earlier to Facebook* – was not put to the candidates. There was much discussion about mines, housing, buses, and empty shops, but no-one talked about bikes or active transport, and they did not take questions from the floor. *Our question: What policies does each party have to encourage people to take active transport to get to work and to help combat the obesity epidemic? We chatted to the candidates afterwards anyway, and I have arranged some meetings later in the week. Jessie Van Der Hoek (LNP) said she was keen to reduce congestion around schools at peak times, while Mathew Stephen (One Nation) was interested in hearing about how bike storage areas at train stations can be improved. Stephen, North BUG: I was excited to get the chance to hear Main Roads Minister, Mark Bailey MP (Labor candidate for Miller), Grace Grace MP (Labor for McConnel), and Philip Anthony (Labor candidate for Clayfield) announce their commitment to the $18million project to extend the North Brisbane Bikeway through to Price St, Wooloowin. If their plan proceeds, the bikeway should be completed by the end of next year! Together with other members of Brisbane North BUG and Brisbane CBD BUG, I have been campaigning for years to get a safe, separated cycling route from the northern suburbs to the CBD, and the project has been beset with frustration and delays. We are not being partisan when we say we support whoever will commit to just getting it done! Belinda and I also had the chance to follow up with Labor’s McConnel candidate (and current Member for Brisbane) Grace Grace MP about the connection of the North Brisbane Bikeway into the CBD at the Roma St parklands. Grace mentioned her discussion with Donald this morning, and said she was excited about the opportunities to create the missing links (including the Roma St overpass) as part of the Brisbane Live project in conjunction with Cross River Rail. Labor’s Clayfield candidate Philip Anthony told us he had lived in the area for a long time, and had never felt safe enough to ride into the CBD. He has also heard time and again from residents that they don’t like riding along the Dickson St corridor. Donald, CBD BUG: This morning I met with two of the candidates for McConnel (the electorate previously known as Brisbane): Grace Grace MP (Labor) and Jamie Forster (LNP). Topics included the Queens Wharf development, Victoria Bridge (where the Brisbane Metro proposal threatens to downgrade cycling access), our ongoing campaign for a minimum grid of protected bikeways in the CBD, the Bicentennial Bikeway ramps and a Roma Street pedestrian and cycle overpass to properly connect the North Brisbane Bikway into the CBD and the Kurilpa Bridge. Both candidates were very willing to listen, but of course the proof is in what is committed in the budget and actually delivered. We have seen grand plans for cycling infrastructure before which have failed to materialise. Mitch, Airport BUG: Andrew, Caroline and myself went along to a Meet the Candidates Forum for South Brisbane organised by community group Kurilpa Futures. The hall on Boundary Street was packed to hear from the candidates: Jackie Trad MP (Labor), Amy MacMahon (The Greens), plus independents Dr Cameron Murray, Karagh-Mae Kelly, Frank Jordan, and Karel Boele. Only the LNP candidate Simon Quinn didn’t attend. The issues raised included over development, green space, traffic congestion, and affordable housing. Some of the candidates spoke about cycling as part of a sustainable transport system. We asked Jackie Trad if she would support lower speed limits to make more liveable neighbourhoods in South Brisbane? She replied yes, and would put up money, but first a comprehensive traffic plan would need to be formulated with community consultation. Dr Cameron Murray replied that he supported cycling and lower speed limits and said the Casino didn’t get community consultation. Amy MacMahon reaffirmed the Greens’ support for a new bridge from West End to Toowong, dropping speed limits, and retaining bike access on Victoria Bridge. The audience made the candidates work hard and we were pleased to be able to raise active transport as an election issue. Caroline, Airport BUG: An early morning trip to the local markets is often a good time, to catch your local political candidates, and I found two of the Nudgee candidates this morning.Labor candidate and current member, Leanne Linard MP has recently made promises about increasing car parking at a couple of local train stations, so I reminded her that they need to increase active travel options as well. Secure bike parking should be just as high on the agenda as more car park spaces. The LNP candidate Debbie Glaze is new on the scene, and wanted to talk about helmet laws and cyclists riding two abreast. I understand this might seem strange for people who only see cycling as a sport, so I was happy to educate; after all, I ride my bike everywhere, and don’t own a single piece of lycra. I pointed out that lumping all cyclists together in one group is like putting people who walk to the shops into the same category as marathon runners. I also spoke to Debbie about active transport options around stations and we talked about the consultation process for Shaw Road, and how disappointed we were with the outcome there. Allyson, Brisbane Sustainable Journeys: This morning I met with Belinda Kippen, LNP candidate for Miller. Belinda occasionally rides a bike herself (including CityCycle, which she’s a fan of) and members of her family are keen cyclists, so she understands the issues at stake. She was keen to hear our thoughts on improving infrastructure in Miller, including along Oxley Rd which is a principal cycling route and King Arthur Tce at Yeerongpilly where cyclist numbers are very high. The LNP policies don’t offer much for cycling infrastructure yet but we are hopeful of further announcements before the election. Chris, West BUG: I spent Saturday morning riding around Moggill and Maiwar electorates, keeping a look-out for local candidates. After braving Moggill Rd to sweep by all the major shopping centres, I spotted Scott Emerson, LNP candidate for Maiwar and current shadow treasurer at Toowong Village. Unfortunately he wasn’t able to chat or get a photo, as he was late for another engagement. A shame, as he also cancelled our meeting 2 weeks ago, but I’m still hoping to catch up with him before November 25. Anyway, it was a good excuse for a bike ride, although Moggill Road is not much fun, and neither is having to ride on the footpath and some of the ridiculous wait times at pedestrian crossings (no wonder they are referred to as “beg buttons”, and also little wonder people get frustrated and take risks). I had more success in Springfield in the afternoon, meeting independent candidate for the new electorate of Jordan, Steve Hodgson. Steve was very impressive with his wealth of knowledge of local issues and enthusiasm for the Centenary Bikeway extension to Springfield, which was cancelled under Scott Emerson in 2012. After that positive meeting, Labor candidate Charis Mullen was nearby. I had met Charis in August and suggested the Centenary bikeway was a key project for the new seat. I was pleased when Charis said she had looked into it and suggested a formal response was coming. Belinda, EaST BUG: I was excited to catch up with Joe Kelly MP (Labor candidate for Greenslopes) this evening at a celebration to mark Stones Corner becoming a suburb again. It was an opportunity to say thank you for being a champion of the Veloway. When we rode together back in February, the Veloway spluttered out at Birdwood Road, but now Stage E is set to fast-track bike commuters all the way to Eight Mile Plains. Of course we can’t wait for Stage D to finally open, giving commuters a great run into the city, and returning the Norman Creek Bikeway to a more relaxed shared path. Now, since we know you can make magic happen, can you (if re-elected) help us convince Council to build the underpass along Norman Creek beneath Logan Road, and connect the weird missing link in the pathway above the busway between Laura St and Lilly St at Stones Corner? It was interesting to hear from Dr Lynham – who is the sitting member and Labor candidate for Stafford – that he is very much in favour of the north-west transport corridor (Trouts Road corridor) becoming a bikeway. When can we start?? Chris, West BUG: I’d started early, and have already been out talking to MPs and candidates before the election was announced, but this week I had a chance to speak to some of them specifically about the election. I visited Dr Christian Rowan MP, representing the LNP in the seat of Moggill. We had a short but to the point conversation about transport solutions catering for cyclists, motorists and public transport users. Dr Rowan is committed to seeking bipartisan support for the plans that will improve transport for people in the western suburbs. After leaving leafy Kenmore, I headed across to Graceville to meet Deniz Clarke, Greens candidate for Miller, braving Radnor Street, where Brisbane City Council is planning to deliver the Indooroopilly Bikeway. Deniz was very interested in how to better integrate active and public transport at train stations in the Miller electorate, and the importance of prioritising north-south, east-west bike routes through the electorate. The need for these separated routes was highlighted when I was close passed and abused by a rat running tradesperson while riding through the designated cycle route in the back streets of Corinda. Belinda, EaST BUG: I’m away for the weekend, so I’m trying to squeeze in lots of campaigning this week. More Greens today, meeting Mansfield candidate Barbara Bell for a coffee on the Goodwill Bridge. Obviously that’s not in the Mansfield electorate, but it’s where many routes into the CBD from the southside converge. Plus, it’s a good spot to observe the popularity of cycling, walking, and taking public transport to work if people have good options to do so. The SE Veloway is easily the top priority for riders commuting to the CBD from suburbs like Mount Gravatt and Wishart, and it’s great to have support from The Greens for continuing to improve this cycling arterial. Barbara is also a big supporter of local bikeways which make it easy for people to make transport choices that are good for the environment as well as good for their health. We agreed that the state government should be doing more to ensure planning decisions don’t treat active transport as an afterthought. On the way this morning, I spotted Di Farmer MP (Labor for Bulimba) talking to commuters at Morningside Station, but as usual I was running late so I didn’t have time to stop for a chat and a photo… again! Belinda, EaST BUG: I’d had a tip-off that Victor Huml, the Greens candidate for Greenslopes would be talking to bike riders on the Veloway at O’Keefe St, so I made a small detour on my way to work. Sure enough, he wasn’t hard to find. Victor tells me he rides a bike himself, and is a big supporter of bikeways – including the Veloway, which saw a continuous stream of riders taking the healthy, congestion-free commute to work this morning. We talked about the importance of providing a decent east-west connection from Coorparoo via O’Keefe St, the PA Hospital bikeway, and from there to the Eleanor Schonnel Bridge and the University of Queensland. The current route around the bottom of Dutton Park Station requires balancing along a narrow footpath and a series of awkward crossings. The works at the southern portal for Cross River Rail and the new Boggo Road Station would provide a perfect opportunity to implement this missing connection. Across the road, I also had a chat with Deniz Clarke who is standing for The Greens in the neighbouring electorate of Miller – but I’ll let Chris and some of our other supporters tell you more about that. Belinda, EaST BUG: Today was supposed to be a rest day, but as it happened I ran into both Amy MacMahon and Jackie Trad again at the Kurilpa Derby in West End. There’s no escaping the Space4cyclingBNE inquisition… Today’s photos are a bit less formal than yesterday. Belinda, EaST BUG: In my local electorate of Bulimba, I’ve met with Di Farmer MP (Labor) regularly over the past 2 years, but I hadn’t had the opportunity to meet LNP candidate Fiona Ward. Oxford St is always a popular spot to find politicians on a Saturday morning, so I set off on my bike – and sure enough, both Di and Fiona were busy talking to locals outside Woolworths. We had a good chat about congestion, parking, and what puts people off riding a bike – like the close pass I had on Riding Road on the way to see her! Fiona is very conscious of the value of exercise as a preventative health measure, and that active transport is an easy way to get a daily dose of exercise. After stopping by Kangaroo Point to talk to Brisbane City Planners about the Kangaroo Point Peninsula Draft Renewal Strategy, it was off to West End Markets to see Amy MacMahon who is standing for The Greens in South Brisbane. The Greens have included the Kangaroo Point to Eagle St bridge in their transport plan–which is exciting for those of us from the east side looking for a shorter and simpler route to the CBD. Over the last decade, both the Queensland Government and Brisbane City Council have included a bridge at this location in their plans, but it always seems to be shelved as too hard, even while massively more expensive road projects proceed. Amy also supports other key active transport links for the South Brisbane electorate: a green bridge from West End to Toowong; ensuring bike access is maintained on Victoria Bridge; completing the riverwalk to Mowbray Park; and protected bike lanes along Vulture St from West End to Woolloongabba. While at the markets, I also got chatting to the Labor folk, and learned that Jackie Trad MP would be at the End of the Line Festival in Woolloongabba later in the day. Being the Deputy Premier, Jackie can be very busy but I was keen to talk to her about bridges, so I grabbed the opportunity. It was a chance to express our frustration with how the issue of bicycle access across the river from South Brisbane to the CBD seems to have slipped between state government and council, with each pointing at the other. Plans for the new Neville Bonner Bridge do not include bicycle access, and access over the Victoria Bridge looks set to become unworkable in Council’s Metro plan. Although supporting green bridges in principle, Jackie made clear her position that Brisbane City Council should deliver the Kangaroo Point to CBD bridge – which is not unreasonable since that was Labor’s commitment going into the 2016 Brisbane City Council election. We did have a good discussion around Cross River Rail, and Ms Trad agreed to look into opportunities for the infrastructure works around the new Boggo Road Station to finally enable the missing east-west bicycle connection between the University of Queensland and O’Keefe Street, linking to the Veloway and the eastern suburbs. Chris, West BUG: With election anticipation and a big area to cover, I started conversations with nominated candidates in the Western Suburbs early. Back in June with the announcement of the Moggill Road Planning Study, I met with Ali King, Labor candidate for the new seat of Maiwar, talking about the benefits and desired outcomes from the study, and more broadly the needs for active transport and how to integrate it with public transport. Ali was particularly interested in the bike parking situation at inner-west train stations like Taringa and Indooroopilly, which aren’t ideal and how the state government might be able to help Brisbane City Council fast track delivery of the Indooroopilly Bikeway to Witton Barracks, Indooroopilly Station and Jack Pesch Bridge. I also met with Charis Mullen, Labor candidate for the new seat of Jordan which covers Springfield, after the Ipswich Mayor by-election in August. The focus was the Centenary Bikeway extension from Camira to Springfield, which was planned and budgeted but removed by the previous State Government in 2012. Charis could see the benefits and promised to investigate it, and hopefully we’ll hear more about it during the election campaign itself. With the announcement of the Sumners Road interchange being funded by both the ALP and LNP, I made the point of meeting incumbent MP Tarnya Smith, Labor candidate Jess Pugh, Greens candidate Jenny Mulkearns and One Nation candidate Ian Eugarde, who all agreed on the need to ensure it delivers for the Centenary Bikeway in the initial design, and that the current design from 2011 has flaws that need to be addressed. I had also scheduled to meet with Scott Emerson, LNP MP for Indooroopilly who is contesting Maiwar, however as the election was called the weekend before he had to postpone. I’m hopeful we will cross paths during the last weeks of the campaign.